WebRTC is a complex component with many optional features. Because of that there are different ways to use it, specially when your solution includes a media server in the middle, and not everybody is using it the same way. In some cases because of the use case requires some specific features, in others because of the background/history of the solution and in others maybe because of lack of development resources the fact is that today it is difficult to find two platforms/servers using WebRTC exactly with the same configuration/features. In this post we are trying to present how some of the most popular platforms/servers are using it. The goal is not to compare them or decide who is the best one (because as we said it depends on many factors) but to give an overview of the different options you have. This table has been made with help from many contributors, mostly the main developers of some of those media servers / platforms and the idea is to keep it updated and extend it. Feel free to reach out to me in Twitter or email address if you want to add/change something. 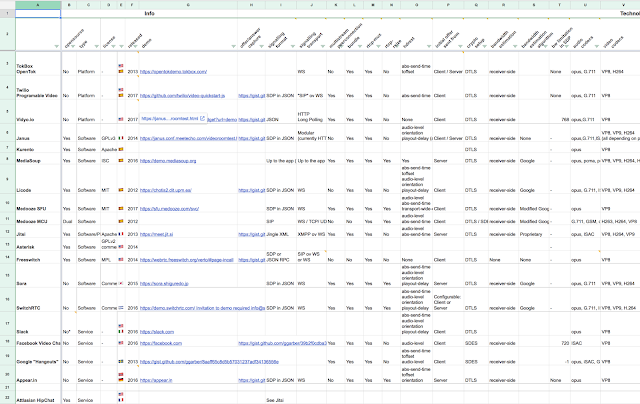 This is the link to the document if you want to read it better: Spreadsheet link . You can find the explanation for the different features in the comments of the column headers. You can follow me in Twitter if you are interested in Real Time Communications.